Apple's ascension to a $1 trillion company Thursday highlights the company's already huge clout over the stock market, since the company is part of the Dow, Nasdaq and S&P 500. But Apple might be the biggest ever in terms of market size, but it is second in terms of market influence to "Big Blue," the IBM of the 1980s, a major "high-tech" bellwether. 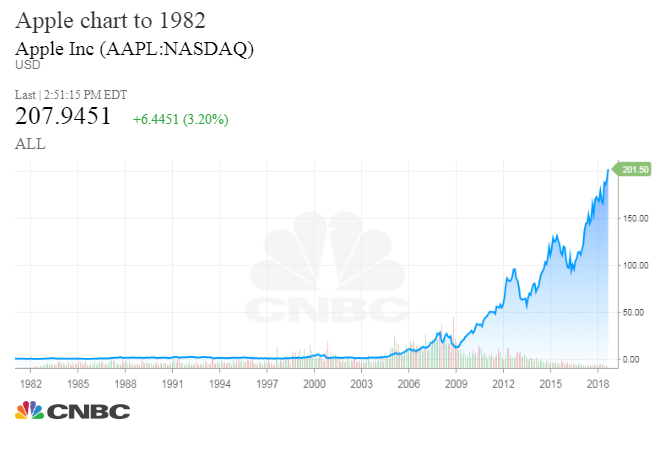 Apple amounts to 4.1 percent of the S&P 500, while IBM was 6.3 percent in 1985, and Microsoft was also bigger than Apple in the 1990s, weighing in at 4.9 percent in 1999. Apple CEO Tim Cook speaks at Apple's Worldwide Developer Conference (WWDC) at the San Jose Convention Center in San Jose, California on Monday, June 4, 2018. Apple obviously has a huge amount of market clout now, but in terms of influence on your portfolio, IBM in the 1980s still holds the crown. Apple just became a trillion-dollar stock, so by it's very nature it is widely held and permeates most equity portfolios through its influence as a member of the Dow, the Nasdaq, the Nasdaq 100, the S&P 500 and the Russell 1000. It's in mutual funds, ETFs and its bonds are in bond funds. It's a tech company, a consumer company and a household name. As the biggest stock, it also has the biggest sway over the S&P 500, accounting for 4.1 percent of the index, but it's no way the most influential tech name the index has ever seen. Based on data provided by Birinyi Associates, it's clear IBM was king when it contributed 6.3 percent to the S&P 500 in 1985, and Microsoft was second-biggest tech heavyweight when it was at 4.9 percent in 1999. Birinyi's data goes back to 1980, and it shows pre-breakup AT&T was at 5.5 percent in 1981, and Exxon was at 5 percent in 2008. General Electric was at 4.1 percent in 2000. Apple is currently followed by Microsoft, at 3.4 percent and Amazon at 3.02. Interestingly, Microsoft's contribution is smaller now than it was in 1999, but its market cap is about $220 billion larger at $826 billion. Laszlo Birinyi, founder of Birinyi Associates, said he first bought Apple in 1997, and he has never looked back. He said it his firm's biggest holding, and he's not worried that it has such a huge impact across the market. Birinyi said Apple's $1 trillion market cap, hit for the first time Thursday, is a positive big round number that should be a draw for investors. "There's a big difference between Apple and a Google, a Netflix or historically a GE. You're not only buying the stock, you own the product, literally," he said. "It's ubiquitous, not only in the market but for all of us. Not only is the stock doing well for you, but you know the product and you deal with the product every single day." Birinyi said he will stay with the stock, unless he sees signs that it is heading for trouble. That could be if it began to invest in businesses outside of its core expertise. "If I see Apple, because they have so much cash, wants to go into oil exploration or something like a supermarket chain, or maybe they own some real estate so they're going to develop their own malls, that's when I would say, there's a change of attitude," he said.